Qualite Sports Lighting manufactures energy-efficient lighting products engineered in accordance with IESNA's guidelines. These standards are critical in establishing lifetime light levels. Tim Clark, president of Tri-Rivers Little League, stated, "As an officially sanctioned Little League, we were looking for uniformity and brightness in lighting that meets the strict standards required. With a Qualite Lighting System, we exceed the necessary lumens in the specs. It is hard to believe the amount of light that is on this field at night." Qualite's PRO-SeriesTM factory-wired, pre-aimed and -assembled fixtures provide the smoothest light available with exceptional spill light control. Designed for optimal beam utilization, excellent playability and energy efficiency, Tennis Optics fills the playing area with uniform light. Aesthetically pleasing, low-mounted Tennis Optics fixtures provide excellent lighting uniformity at night while blending in during the day. The luminaire and its optics offer advanced design and superior performance with sharp cutoff and high-quality construction that minimizes light pollution and unwanted glare while keeping the light on the tennis playing surface. Tennis Optics is the ultimate lighting application when it comes to energy efficiency, design, performance, reduced light pollution and the most uniform light possible. Replace unsightly and costly-to-assemble field-built, strut-mounted equipment with a Milbank commercial pedestal. Commercial pedestals protect all electrical equipment inside a lockable, vandal-resistant NEMA 3R pad-mounted cabinet. Commercial pedestals are perfect for metering and controlling parking lot and athletic field lighting, sprinkler and irrigation controls, etc. Equipment, including metering equipment, timers, clocks, photoelectric cells, power receptacles, surge protection, branch and main breakers, and more, can all be factory-installed. Commercial pedestals with receptacles also are ideal for temporary site power. LSI Courtsider® Sports Lighting introduces its new optical system known as ARTTM (Advanced Reflector Technology). Utilizing a 1,000-watt metal halide reduced-envelope lamp, ART delivers more than 10 percent additional light to the court area, while reducing stray illumination outside of the court boundaries. ART is now featured in all Courtsider XL fixtures, packing them with performance. ART is another smart energy solution from LSI. Luraline presents the Securaline series of wall packs, flood lights and security lighting. The series is available in a variety of configurations with choice of incandescent, compact fluorescent, high-pressure sodium or metal halide lamping. Shown is the WPE Euro-styled polycarbonate hooded wall pack, which features a bronze die-cast back with clear prismatic polycarbonate diffuser and compact fluorescent lamping. SOL Inc. was founded in 1990 as Solar Outdoor Lighting. SOL is a leading manufacturer of commercial-grade solar-powered lighting products and systems. SOL has focused on developing the most efficient and reliable solar-powered lighting and power systems for applications including parking lot, security, general area, billboard, transit shelter, street and transportation safety lighting. SOL's systems come with an industry-leading 5-year system warranty. Headquartered in Palm City, Fla., SOL's patented products are installed in more than 50 countries worldwide. 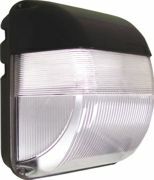 Ruud Lighting's Cutoff Floodlight is ideal for outdoor sports lighting such as tennis and volleyball courts. The CF Series has an optical system specifically designed to ensure maximum main-beam projection, while minimizing spill light. The CF Series is available in 12-, 16- and 22-inch housing sizes and wattages from 70 to 1,000 watts and HPS, MH and PSMH lamps. Available accessories include an adjustable backlight shield, a wire guard and polycarbonate vandal shield.